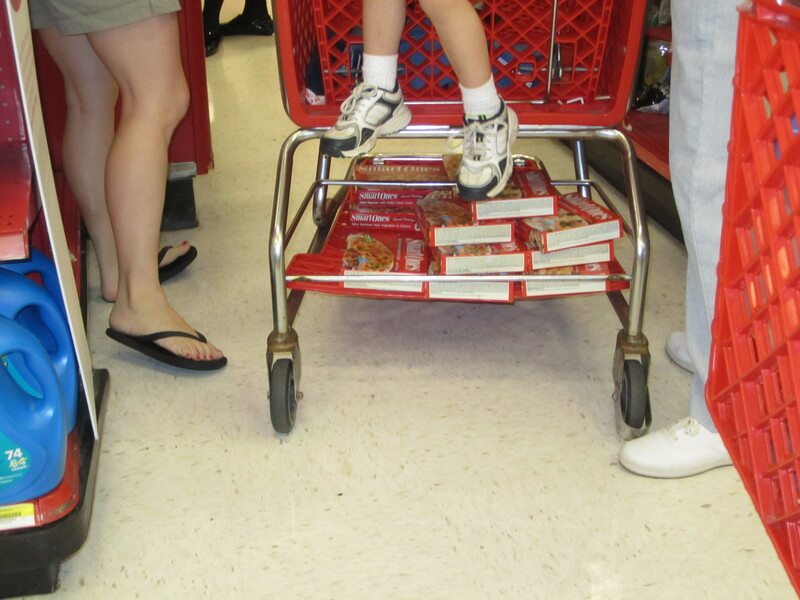 At a recent trip to Target we stood behind a family who seems to have found the solution to cooking family meals… don’t! This mom and grandma, with toddler in tow, had stocked up on what looked like a months worth of Smart Ones meals. What you see on the bottom of that cart only represents half of what she was buying. Anyone out there a big fan of Smart Ones? Do you think this is a good way to feed the fam? Or perhaps she cooks real food for them but is just trying to keep her points down and fit into that bathing suit this summer. Damn, I hope her micro doesn’t go on the fritz! 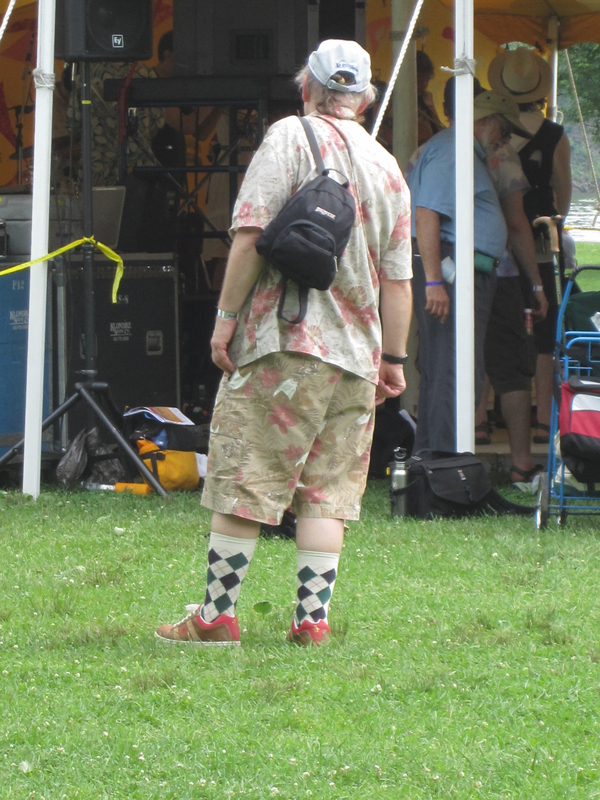 We saw this guy at the same music festival where we saw the Hokey Pokey bumper sticker; it was quite an amusing day. So, I look at this guy and I think, OK, this is a music festival and he is feeling his old hippie oats and wants to wear this outfit that makes him look like… well it makes him look like he just crawled out from under a rock. I mean, it’s not like he was wearing tie dye or something. This outfit was NEVER stylish in ANY era. The shoe and sock combo is to die for on their own but paired with the matching floral cabana set it is hard to look away from this fashion accident. Anyone want to speculate whether he dresses like this everyday? And if yes, what do you think he does for a living? There I was, winding down the night with a last perusal of Facebook when I stumbled upon a post from one of my craziest friends from college. (keep in mind I went to art school). He had linked to a video of an audition he had done for Discovery Channel. Although I think this would make a great show, what struck me was not its TV-worthy value. It was more that I got to visit with him in his natural habitat, just as I remember him. This is the guy that was always doing things on a grand scale. A visit to his house could involve fire, blades, welding tools, heavy machinery, mud… anything extreme. If I recall, he bartered his rent for house renovations on an old farmhouse the last two years of college. Never bored at Scott’s house. And the best part? He has not changed one single bit. (although he has perfected the art of hammer juggling). Time and circumstance sometimes have a way of causing you to lose touch with those you loved the most. Friendships sometimes fade, not because you want them to… just because. In defense of social media – people can ebb and flow right back into your life. There is nothing better than the gift of seeing someone again. Just as you remember them. Watch this and I dare you to tell me you are not jealous that I have a friend like this? And check out his work; he is wildly talented. Ok, let’s get passed how damn cute these two were and think about how utterly amazing June 24, 2011 has become. On the very day that my parents are celebrating their 60th (!!!!!) wedding anniversary, the great state of New York has given the right to EVERY one of its citizens to grow up and marry the person they love. The two little boys in the picture did get the chance to grow up and marry the person they love, but they were forced to do so in another state because the one in which they lived did not give them that option. In the very state in which they pay taxes, work hard, fight for causes, make a difference every day; they were not considered eligible to be married. That cutie on the left is one of my dearest friends on earth – my gay husband. He has fought tirelessly for the cause. Tonight it has all paid off. Never in the history of the long road of friendships we have shared, have I been happier to celebrate a victory so huge that I can barely type through the tears. Those magic numbers: 33-29. The great friggin’ state of NY has finally stood behind the premise of equality and made history. I am so proud, so moved, so through the roof ecstatic for those who have fought so hard and won the rights for so many. Frank, you are an inspiration, my favorite dog with a bone, the man who never says die and puts not only your money, but your time, where your mouth is to fight for a cause. 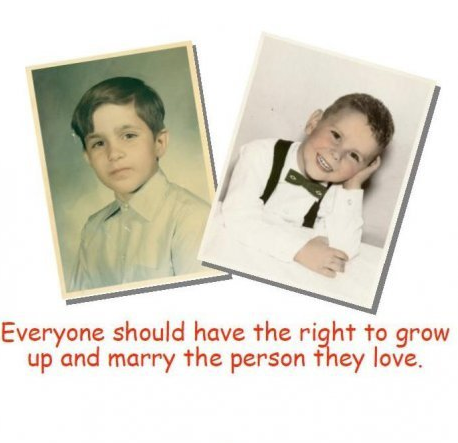 I am thrilled for all those who will finally be able to ‘grow up and marry the one they love’. To quote a favorite children’s book, “Let the wild rumpus begin”. File this under ALWAYS carry a camera. This sticker was on pillar of a building on Houston Street. I took a shot with my phone and posted it to facebook, but right after that I got a shot with my camera with these people walking by that made it even more interesting. After a little Googling I found out that Only. is ‘an independent brand based out of the West side of Manhattan that offers quality goods, released in limited quantity.’ You can find out more about them here. So? What is your answer? There are certain bands that feel like the soundtrack of your life. Everyone has them; the bands they grew up on. When you hear their songs it brings you back to those lazy days of your adolescence – hours on end spent listening to music in your friends’ rooms. Every note, every lyric burned into your brain for eternity, evoking those memories that you built your friendships on. For me these bands are woven into the fabric of who I am, what makes me feel like me. For some reason, every time I hear early Springsteen, I am transported back to my friend Ali’s room. She must have been the first one to turn us all on to Bruce. All these years later I still never tire of those songs. They feel like home. Like friendship. Like my High School girls who were, and always will be, there for me no matter what. Fast forward to college, the sound of Springsteen will forever sound like a night at Neal’s house. Air guitar abounding, there was not a note we did not know. And in the center of all those songs was The Big Man’s big sound – that sax that could cut right through you. When Clarence blew, we all sat back and felt it to our core. His sound was so distinct it felt like a vocal. A loss shook through the land of rock ‘n roll this weekend when Clarence Clemons died. So here’s to Clarence, “the Minister of Soul, the Secretary of the Brotherhood, probably the next King of England” the biggest Big Man of them all! Of all his famous solos, Jungleland stands out as the ultimate example of his soulful power. Sit back, close your eyes, and mourn the passing of one of the most beloved men in rock ‘n roll. RIP Clarence. Heaven is going to be rockin’ this week for sure! Hey kids, this looks like a good spot to picnic! Um, Grandma, what does that sign say? I stumbled upon this scene at the Clearwater Festival this weekend. There was a festival-style food court with picnic tables all over the place. Whatever possessed the adults in this crowd to park here is beyond me. I am thinking it might have been the heat. Mom seems to be sucking down that iced tea like she really means it. 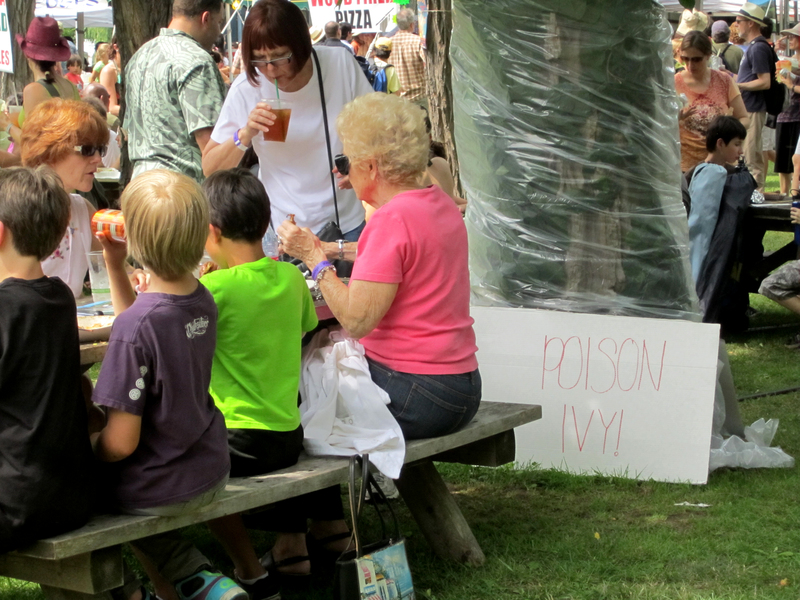 I love how they wrapped the tree in plastic to help avoid the spread of poison ivy. My question is what about the poor schnook that did the wrapping? Hey kids, next week let’s go to the beach with shark infested waters.